The phonebook on the Galaxy Ace 3 packs a wide range of features. Four tabs on top provide access to the Phone app, Groups, Contacts and Favorites. As usual, there are various options to filter contacts by phone numbers, groups and multiple sorting. You can move contacts to/from the SIM card but you can't display them alongside the phone memory entries. A call or a message to someone can be initiated directly from the contact list with a right and left swipes respectively, which is really handy on the go. The Quick contacts feature, upon a tap on the contact picture, shows a pop up menu with shortcuts to call, video call, text or email. Tapping on a contact reveals all the details available. Information is perfectly organized into different sections for phone, email, etc. You can use the back button to go to the full contact list, or tap in the top left corner, just like in vanilla Android. The top right corner has shortcuts to contact editing and favorites. If the phone book finds duplicate contact entries, it'll prompt you to join them. Furthermore, there is a plethora of options once you hit the Menu button. You can view the call history, as well as join, unjoin and share contacts. The reject list blocks certain numbers from calling you, even just prefixes (you can block international callers). It works great with preset numbers and you can also bar unknown numbers. There are third party blacklist apps in the Play Store but it's nice to have this out of the box. You can choose a specific vibration pattern as an incoming call alert, just like you would a ringtone. A set of predefined patterns is offered, but you can make your own too. You can also assign a custom vibration to specific contacts. The phonebook app on the Galaxy Ace 3 is really something. It's almost too advanced for some users but its interface is simple enough so you can only use the features you need. Once you get your bearings you will appreciate having cool extras like Direct Call and selective call barring, which stock and most other reincarnations of Android lack. 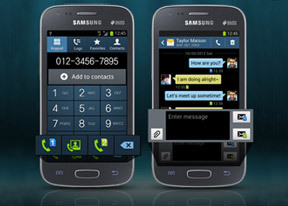 If you have the dual-SIM variant of the Galaxy Ace 3, you'll get a special dual-SIM interface in the settings menu. This lets you rename your SIM cards for easy identification (the Ace 3 will remember settings for specific SIMs), as well as choose which card to use for establishing mobile data network connections. The notification are also has a quick toggle with which you can switch your active SIM card. The Samsung Galaxy Ace 3 offers top notch in-call audio and managed to hold onto reception with ease. Earpiece volume is great and Samsung has even gone as far as adding an in-call equalizer, which does wonders if you want an even louder experience. Native video calls are available as well, right in the phone app. The Galaxy Ace 3 has Smart Dial, which searches names and numbers simultaneously. Only one contact is shown (with contact photo) and you can tap the down arrow to view the rest of the matches (the number above the arrow indicates how many contacts have matched your query). Direct Call is available too and lets you dial a number by lifting the phone up to your ear while browsing contacts or reading/composing a message. Voice dialing is on hand and it's taken care of by the S Voice service, which activates on a double tap of the home button. Or you can alternatively say "Hi Galaxy" while you have the phone unlocked and directly speak your command afterwards (e.g. "call Dexter"). It takes a while to process voice commands but it has more uses than other third-party voice-recognition apps for Android. Thanks to the proximity sensor, your screen will automatically turn off when you hold it next to your ear during a call. The available options during a call include taking a note, using the keypad, muting, holding the call or adding another person to the conversation. The Samsung Galaxy Ace 3's loudspeaker scored a Below Average mark, which means that you'll have a hard time hearing in loud environments even at it loudest volume setting. You can find more about the testing process here.